Kitsap County residents can safely dispose of the medicines they no longer need by taking them to drop-boxes located throughout Kitsap County. Participating pharmacies, clinics, hospitals and law enforcement offices will accept most prescription and over-the-counter medicines for disposal. There is no cost to residents to use this service. This program is managed by MED-Project, the entity hired by pharmaceutical manufacturers to implement the Product Stewardship Plan, as required by Kitsap County Public Health Board Ordinance 2016-02: Secure Medicine Return Regulations. A more complete list of accepted items is coming soon. Cosmetics, shampoos, sunscreens, toothpaste, lip balm, antiperspirants or other personal care products. Pet pesticide products contained in pet collars, powders, shampoos, topical applications, or other forms. What do I do with used or unwanted medical sharps? State and local laws prohibit placing loose sharps in your trash. Sharps thrown into the trash can hurt people or be used illegally. Many pharmacies sell sharps containers and accept properly contained sharps for a small fee. Visit the Kitsap County Solid Waste web page for local disposal locations. Watch this quick tutorial for tips on properly disposing sharps. If you find a sharp at a park or other public place, please contact us. Why should I use secure medicine return? Unused, unwanted and/or expired medication in your home pose a risk to you, your family, and your community. The home medicine cabinet is one of the most common places people go when looking for drugs to get high. Many young children get poisoned by taking medicine not intended for them. When you flush medicine down the toilet or throw it in the trash, it pollutes our water and soil. The Secure Drug Take-Back Act creates the nation’s first statewide, comprehensive drug take-back program to be financed and provided by pharmaceutical manufacturers that sell drugs in Washington state. The Kitsap County ordinance will remain in effect until one year after the manufacturers’ statewide drug take-back program is launched and providing services. The program will then merge into a consistent statewide drug take-back system. Provides drop-off locations for unused medications throughout Kitsap County. Expand safe medicine disposal options for Kitsap County residents to reduce risks of misuse, poisonings, and overdoses from leftover and expired medicines, and reduce the amount of pharmaceuticals entering sewer, septic, and solid waste systems. Improve convenience for residents by expanding locations of secure drop boxes from law enforcement offices to pharmacies and hospitals, as now allowed under DEA regulations. 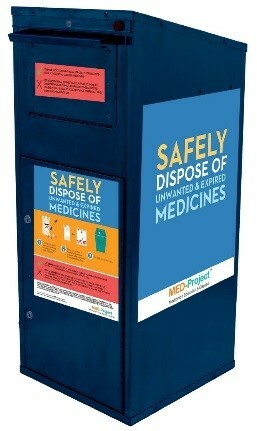 Provide an option for residents to dispose of unused medicine by mail at no charge. Require the pharmaceutical industry pay for these programs. These regulations ensure financial sustainability through a pharmaceutical industry-financed system providing sufficient resources to promote the program and handle larger volumes of returned medicines, and that relieves burdens on local government agencies and taxpayers. For information on Kitsap County’s medicine take-back program, please contact Bryan McKinnon (360) 728-2304 bryan.mckinnon@kitsappublichealth.org.